APE 2014 offers an eclectic schedule of programs and workshops geared around the show's special guests and various aspects of independent and alternative comics. These programs promise to be fun, informative, and enlightening conversations with some of the top creative talent working in comics today. Be sure to check out these creators' books in the Exhibit Hall once you've heard them talk about their work! 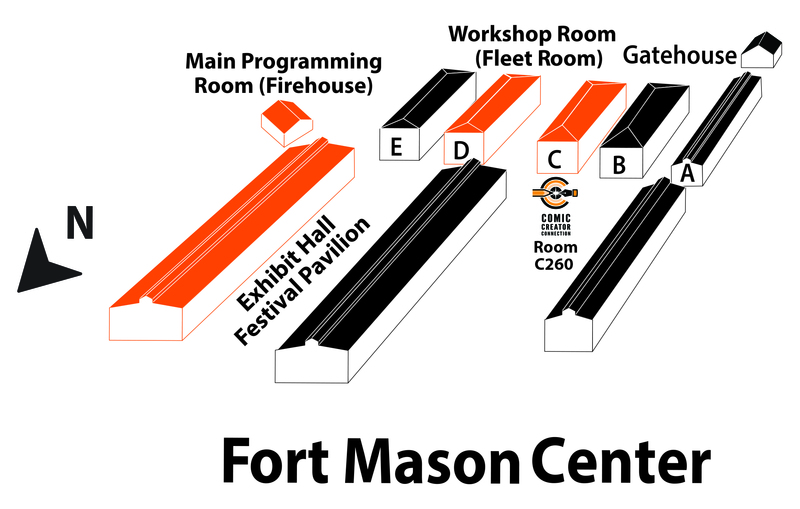 With the change of venues to Fort Mason Center, APE Programs and Workshops, along with the Comic Creator Connection, move out of the Exhibit Hall and into nearby buildings on the Center's campus. See the map below for the exact location of each building and which event is housed there. APE 2014 Programs  will be held in the Firehouse, located next to the Festival Pavilion where the APE Exhibit Hall is located. Exit the main doors of the Pavilion and turn left or exit the side doors inside the Exhibit Hall to access the Firehouse building (please note that if you exit the side doors, you will have to re-enter the Exhibit Hall through the main front entrance). Click here for the program schedule for Saturday  or Sunday . The Workshops  room is located across the parking lot in the Fleet Room on the first floor of Building D.
The Comic Creator Connection  will take place on Saturday only from 4:00 to 6:00 pm in Room C260 on the second floor of Building C. Online registration was held in advance for the CCC; some slots may still be open, especially for artists. If you're interested in attending and did not preregister, please show up approximately one-half hour before the CCC begins to check for available slots. Click here  for more information. APE 2014 is also featuring 24-Hour Comics Day on Saturday. Look for writers and artists creating comics for this special event in the Exhibit Hall at tables 1049-1052, at the rear of the Exhibit Hall. Come see these creators work their magic on their own 24-Hour comics! Seating is limited in all of APE 2014's program rooms, so be sure to arrive early for these must-see panels and workshops!